There is a style of 1970s/80s US radical feminist writing that takes 'man-made language' to task, disavowing the patriarchal voice with its impassive claim to objective authority, and developing a discourse that foregrounds personal subjectivity and poetic language. It is a 'raving' discourse that reclaims elements of experience seen as being denied as 'hysterical'. 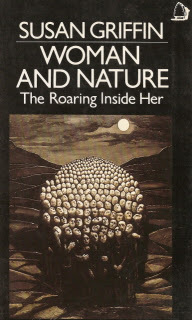 This style is particularly associated with Mary Daly, but is also found in Susan Griffins's Woman and Nature - The Roaring Inside Her (1978). The following are some extracts from the latter on dancing and music. I am particularly struck by the immersive conception of music as a wave that sets us in motion. This above all, we have never denied our dreams. They would have had us perish. But we do not deny our voices. We are disorderly. We have often disturbed the peace. Indeed, we study chaos - it points to the future... Many of us who practiced these arts were put on trial. We stood at the gates of change, but those who judged us were afraid. They claimed the right to order the future. They would have had all of us perish, and most of us did. But some kept on. Because this is the power of such things as we know - we kept flying through the night, we kept up our deviling, our dancing, we were still familiar with animals though we were threatened with fire and though we were almost to a woman burned. And even if over our bodies they have transformed this earth, we say, the truth is, to this day, women still dream. We move our feet together. She sees lives half lived becoming whole. She reads stories that have never been written. Sees whole cities grow up, and the new growth of forests that were razed long ago. She sees all kinds of marvels far beyond what we ask her to see, things, she says, we could not even dream. We would think her raving, but she speaks to us so sweetly of what she says can be, that we too begin to see these things. The string vibrates. The steel string vibrates. The skin. The calfskin. The steel drum. The tongue. The reed. The glottis. The vibrating ventricle. Heartbeat. Wood. The wood resonates. The curtain flaps in the wind. Water washes against sand. Leaves scrape the ground. We stand in the way of the wave. The wave surrounds us. Presses at our arms,, our breasts. Enters our mouths, our ears. The eardrum vibrates. Malleus, incus, stapes vibrate. The wave catches us. We are part of the wave. The membrane of the oval window vibrates. The spiral membrane in the cochlea vibrates. We are set in motion by what moves outside our bodies. Each wave of a different speed causes a different place in the cochlea to play. We have become instruments. The hairs lining the cochlea move. We hear. To the speed of each wave the ear adds its own frequency. What is outside us becomes us. Each cell under each hair sends its own impulse. What we hear we call music.